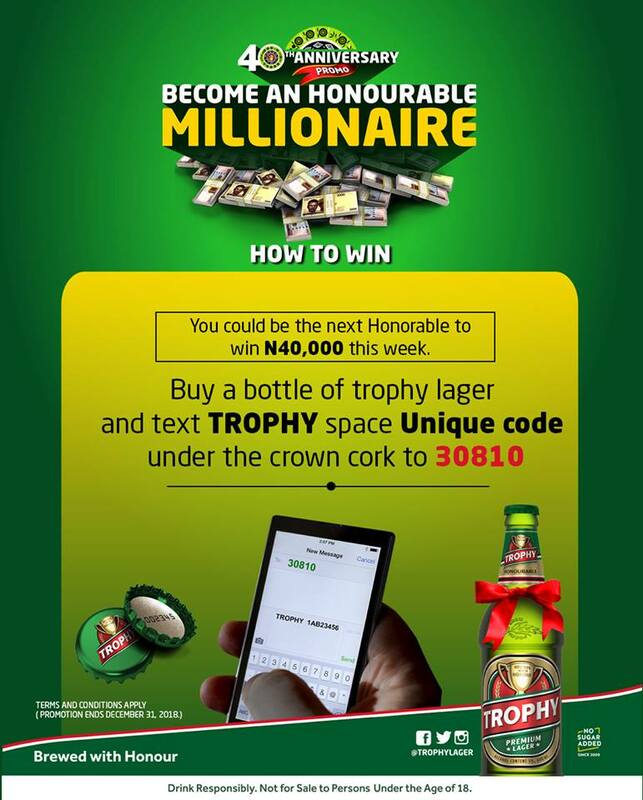 Instant airtime and Cash prizes are up for grabs. 1. ‎Buy bottle of Trophy larger beer. 3. ‎Text the "TROPHY" space " ‎unique code" under the crown cork to 30810 to receive instant N100 airtime and increase your chances of winning a million Naira . . . #BeHonorable. I won airtime! on dis 07083444959 till now they never credit me. is dis promo real? Pls how did you win? Are you removing charges on the service before the message got send?? How much are they removing for charges on the service carrier??? It real,I just got an instant card now. Wow this is the first time I win and received it. I play and text five cork everyday till they tell me to keep the remaining cork to use and play for tomorrow that I can only text five cork for a day and till now I have not won the one million. Please I hope is real because is not easy at all, 08038736078. Enter your comment...I Have Been Loading The Corks Since And I Haven't Got The 1m Why ? Why is the airtime only for the first trial and nothing more since then? Please how did you win ? Trophy promo is more than real. i won airtime and also qualified for their big money. Pls how did you ? I just believe that it takes being real to be an honourable beer brand. I didn't receive any card on my line of which I got a message saying I have been rewarded with N100. Why? I have been loading more than 50 code but nothing yet. When is this promotion going to end? This is more than reality, they gave me airtime two times. Keep on drinking! When is the final draw since the promo has ended?